The frame "Anchors" contains a table with the list of anchors. Adding anchors is performed in the "New anchors" dialog window. The input anchors can also be edited on the desktop with the help of active objects. The program employs the following coordinate systems. The anchor head (starting point) can be automatically hooked to the ground, an arbitrary interface or opening (tunnel lining). The anchor head is then automatically positioned in to the intersection of the anchor line determined by the input points and the selected line. The anchor can also be introduced directly by specifying coordinates of the two end points. Anchors as stabilizing or reinforcing elements are represented by elastic tensile-compressive bar element with constant normal stiffness. The maximum allowable tensile force the element can sustain controls tensile failure of the anchor.The bar element is anchored into the soil only at its staring and end points. No mutual interaction between the soil and the anchor along the anchor length is considered. Anchors are defined by their starting and end points and by their stiffness. The program automatically links the anchor element degrees of freedom to the actual degrees of freedom of the predefined finite element mesh. Therefore, the anchor can be introduced anywhere in the structure. The anchor stiffness is specified in terms of the elastic modulus and its area. The program makes it also possible to enter the anchor diameter - the area is then determined automatically. In stability analysis problems the anchor stiffness is not considered. Its action is realized only through the prestress force introduced automatically as external compressive force acting at the anchor head. Other important parameters are the prestress force and the tensile strength (the anchor breaks when the tensile strength is exceeded). For elements with no prestress the prestress force is set equal to zero. Sufficiently large value of the anchor tensile strength may be specified to avoid anchor failure. By default the anchor does not support a compressive force - anchor elements loaded in compression during a certain stage of calculation are temporarily disabled. If tension occurs in subsequent analysis run (due to change in load, geometry or material parameters of soil), the program automatically introduces these elements back into the analysis. 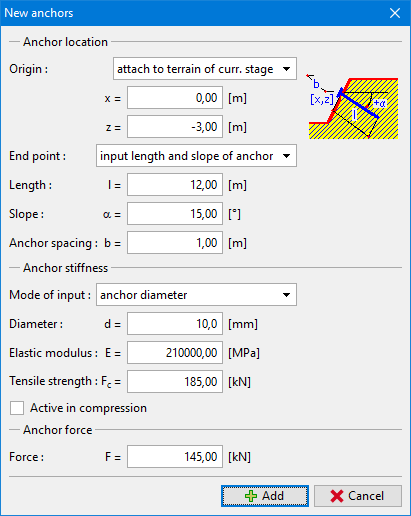 The program makes also possible to include compressive response of an anchor. However, for elements loaded primarily in compression we recommend to define these elements as props. The anchor deforms during analysis. Such deformation together with the deformation of the surrounding soil may cause reduction of the specified prestress force in the anchor. Providing we wish to achieve a specific prestress force in the anchor, it is necessary to either post-stress the anchor to a given value in the next calculation stage or to use a sufficiently large magnitude of the prestress force right from the beginning to compensate for a possible drop (the resulting anchor force after completion of the calculation step is displayed at the anchor head below the prescribed prestress force). In subsequent stages the program allows only for anchor post-stressing - change of the initial prestress force, or for removing the anchor from the analysis. Introducing pre-stressed anchors into the soil may lead to plastic deformation of the soil in the vicinity of the anchor head or root. Some modifications of the original input are than required to avoid often encountered loss of converge.